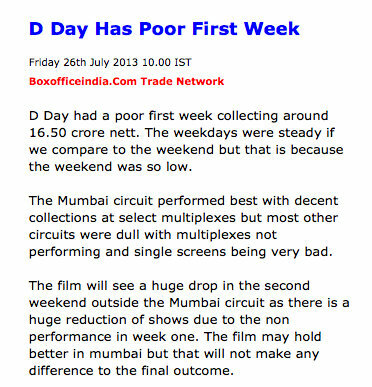 This is a very prickly subject for most films not just for D Day. Especially big star films when it comes to opening day/ weekend numbers. 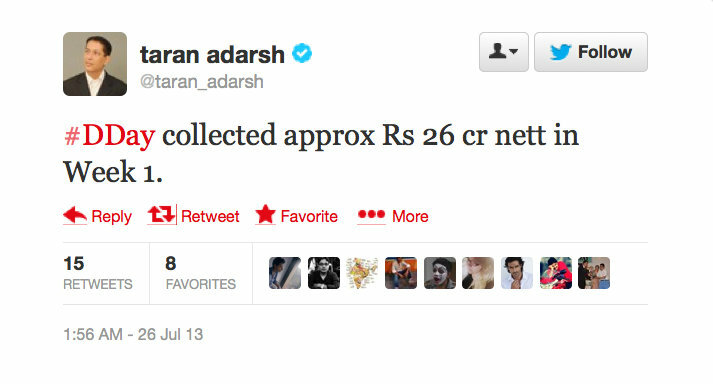 Taran often provides the “official” numbers provided by the producers or studios themselves and to his credit, generally clarifies that source in his tweet or update. Obviously, studios/stars/directors have a vested interest in giving a higher figure. I have seen Wikipedia entries for some Bollywood films also carrying amazingly inflated box office numbers. The most common trick used by producers is to give out GBO instead of NBO. The second is to add international box office & pre-sales numbers. In the old days, I am told producers used to add satellite prices also to opening weekend numbers. Hard as it may seem to believe, things are actually getting better. As a thumb-rule, I have heard from various producers that the closest to actual figures tend to appear on boxofficeindia (the website, not the magazine). But it would be a few years before we have a Rentrak-like system, especially when we have so many cinemas in UP, Bihar etc which do cash business, and don’t report actual numbers. When you get the opportunity, do also look into the desi bollywood twitterverse scene. It is also ridiculous. The way film people themselves promote their movies leveraging Twitter, is not really honest and sometime borderlines unethical. I stopped taking Adarsh seriously a while ago.